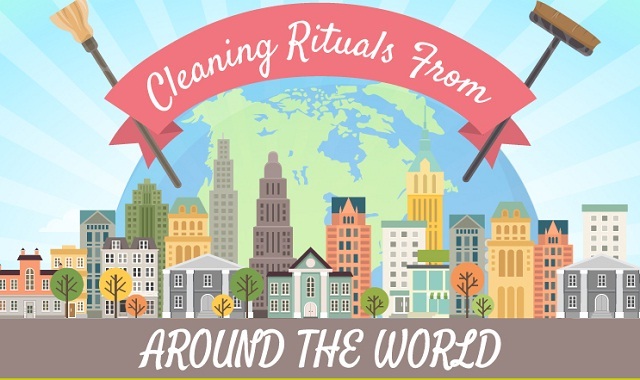 Cleaning Rituals From Around The World #infographic ~ Visualistan '+g+"
Cleaning is a major part of society. It happens all over the world and has been since the dawn of civilisation. Spring cleaning can actually be traced as far back to Iranian “Nowruz”, the Persian new year, which falls on the first day of spring. To this day, Iranians continue the practice of "khooneh tekouni" which literally means "shaking the house". The fascinating thing about cleaning is that the process can differ from country-to-country, culture-to-culture. This is due to multiple factors, like societal norms, religion, landscape and much more. Many of these variances have become ritualised over time and it is this ritualisation which Twinkle Clean's infographic further explores.